Everyone has certain tasks and abilities that provide us with this inner feeling of accomplishment. There is nothing quite as relaxing as feeling like you have done something perfectly right, and have that task behind you. 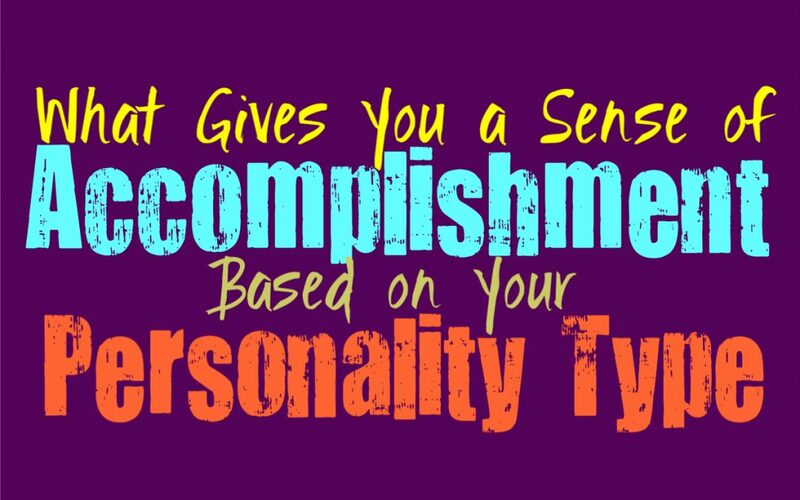 Here is what gives you a sense of accomplishments, based on your personality type. INFJs do enjoy feeling that sense of accomplishment, and they can often earn this from different things. For the INFJ it is important to be able to get things done to the best of their ability, but they do hold themselves to high standards. Whether this be completing a work task, or helping out their loved ones with something important, INFJs want to feel like they have really done something of value. They often compare their accomplishments to others in some ways, hoping that they can measure up and maybe even do a bit better. If they feel like other people have done more, the INFJ will lose that sense of true accomplishment. They feel even more accomplished when they feel an appreciation from their loved ones, or get some sort of compliment on their work. ENFJs believe in working hard to get things done and be able to accomplish their goals in life. For them it is important to remain focused on the many tasks they often have juggling at once. Being able to finish those many different chores to their own high standards, will certainly provide the ENFJ with a sense of accomplishment. They also feel this accomplishment when their loved ones show a sense of pride in their efforts, and will feel deeply rewarding by this. ENFJs have so much going on at once, and only feel true accomplishment as they check these things off of a list, and get to see them come to fruition. INFPs are complex people who often decide things much differently than those around them. They feel a sense of accomplishment when they have been able to achieve something personal. For the INFP accomplishment only comes from achievement which hold a moral and sincere vale to them. It isn’t about just getting something done, it is about doing something which they personally believe in. INFPs want to make a difference in the world and believe in striving to help others and do something important. ENFPs do feel a sense of accomplishment when they get certain tasks finished, even the smaller less important ones. Just being able to do something and see a look of pride on their loved ones faces, is actually really rewarding for them. ENFPs want to feel like they have done something which receives praise, in order to really feel that accomplishment. They often have certain tasks and skills which they believe in, and those goals are sincerely personal for the ENFP. If they can prove their abilities by accomplishing something tied to their personal goals, the ENFP will feel a strong sense of accomplishment and pride. INTJs are hardworking with a lot of personal goals and desires. INTJs feel accomplishment when they have finished a project, but only when they have done so with a sense of perfection. If they were to get something done but not have it be up to their own high standards, the INTJ would not feel this accomplishment at all. They would almost want to go back and finished this again in order to perfect it the right way. INTJs only feel real accomplishment when they have done something even they are impressed with, something that sets them apart. INTPs can sometimes struggle to really feel a sense of accomplishment in the things they do. They are always hoping for something better and something even more impressive. They bounce around and want to try new things, and enjoy pushing themselves. INTPs are always curious about something new, and so they might actually jump from one project to the next. This makes it challenging for them to really feel a sense of accomplishment. When the INTP does finished a project or get something done which they are pleased with, they will finally feel that sense of accomplishment. ENTPs can sometimes find themselves bouncing from one project to the next, and this can prevent them from entirely feeling a sense of accomplishment. ENTPs are curious about new things and want to really experience enough to learn from it. They do feel a small sense of accomplishment when they know they have really learned from something and taken away from it. For them it is about being able to grow from what they have done, and really advance themselves towards the future. ISTJs are hard workers who believe in really pushing themselves to get things done. For the ISTJ they feel this sense of accomplishment from even the smallest of tasks, all the way to the larger ones. As long as they have completed these tasks with skill and have impressed themselves, the ISTJ will definitely feel accomplishment. They do hold themselves to rather high standards, but they are good at being prepared for most situations. For the ESTJ it is important to always get their work done with a sense of perfection and skill. They don’t simply getting things done, instead they want to be sure they do each task perfectly. ESTJs feel a sense of accomplish for just about anything, as long as they feel like they have lived up to their own high standards. It isn’t about how big the finished project is, it is more about how well done it truly is. ISFJs believe in providing for their loved ones, and believe in doing whatever they can to take care of them. When the ISFJ sees happiness in their surroundings and has brought a sense of peace to their loved ones, it definitely makes them feel accomplished. It is about being able to please those around them, and actually seeing that hard work come to fruition. ISFJs want to feel like they have really been able to provide for those around them in order to feel accomplished. ESFJs feel a sense of accomplishment when they have been able to finish their tasks with a certain level of perfection and skill. They feel even stronger pride when someone they love is impressed with them and their abilities. ESFJs want to feel like they have really been able to impress those around them, since pleasing their loved ones is often one of their most important personal goals in life. ISTPs often feel a sense of personal accomplishment when they have been able to really push themselves outside of their comfort zones. They often want to impress themselves by doing something that is out of the box and also truly skillful. ISTPs often have many hobbies and interests, but are most pleased when they can perfect ones that hold personal value to them. ISTPs feel accomplishment in the little things as well, but this comes from within and not from how others perceive them. ESTPs often feel a sense of accomplishment when they can complete a task which would normally give them trouble. Simply being able to set aside time and finish things that have been weighing them down, gives the ESTP a sense of accomplishment. They want to be able to finish things but sometimes they find themselves feeling a bit distracted. When they can really sit down and finish something the ESTP feels immense personal accomplishment from this. ISFPs have strong inner morals and emotions, and so they believe in following their own beliefs. ISFPs feel a sense of accomplishment from many different things, depending on their current situation. They do feel accomplishment from finishing projects of their own, often more artistic ones. ISFPs also feel this accomplishment from the people they trust, especially when those people are proud of them and impressed by their skills. ESFPs feel accomplishment when they feel close to those around them, more than just when they get something done. It is about feeling like their loved ones are proud of them and can actually recognize their accomplishments. They can actually struggle to feel proud of themselves without feeling like their loved ones have been there to support them. They care about being someone others can turn to and be impressed by, more than most people realize.